Hang Man graduated to metropolitan racing with ease to notch a comfortable win at Sandown on Wednesday. The lightly raced import overcame early buffeting to take out Wednesday's Ladbrokes Back Yourself Handicap (2400m). Ridden by Patrick Moloney, Hang Man started the $1.70 favourite and after joining in 400m out drew away wide out on the track to defeat Ancient King by 1-1/2 lengths with Midas Man a nose away third. Hang Man arrived in Australia late last year after finishing second on debut at Ascot and has now won three of his five starts since joining Moroney. Moroney plans another similar grade race for Hang Man before heading to Flemington for a rise in grade next month, then a spell. What impressed Moroney about Wednesday's victory was how he was able to hold his position after the early buffeting. 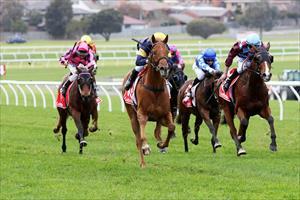 "I thought it was a really good ride as he didn't get any favours," Moroney said. "Someone tried to ride him into the fence with a round to go and Patrick didn't want to go there. He then got in between horses and had to push his way out at the right time. Patrick Moloney has ridden Hang Man in his five races in Australia and said the four-year-old is still improving. “He travelled beautifully for me - it got a bit tight there but he coped with it all and stayed relaxed,” Moloney said. “I had plenty of horse coming into the straight but it’s a long way home on the Hillside course so I was happy to sit and wait.